YOU could not imagine sitting Denis Irwin and Pete Boyle at a table together and for them to be still talking long into the night hours later. Irwin’s quiet man image doesn’t tally with Boyle’s propensity to break into a Manchester United themed song at any time of the day or night. 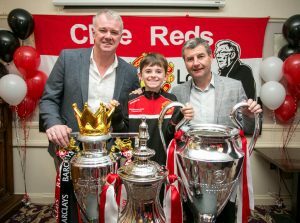 Irwin, who played for United for 12 years, Gary Pallister and Boyle, a legendary fan, were guests of the Clare branch of the Manchester United Supporters Club at the Auburn Lodge Hotel, Ennis last Saturday. 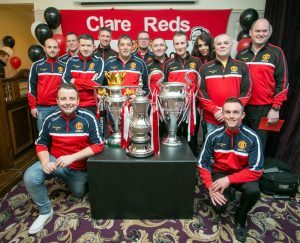 Up to 300 people attended the insightful and entertaining evening, with United fanatic Boyle acting as master of ceremonies. At the Manchester United supporters event at The Auburn Lodge. Photograph by Arthur Ellis. At one point, Irwin told a story about a pre-season tour of the Isle of Man, long before he joined United. He returned to the team hotel at 3am, following a night out but was unlucky to meet his then manager emerging from the hotel bar. Irwin revealed that the lesson he gleaned from that night was not to return as early the next time. A couple of hours before the formal question and answer session, Irwin and Boyle sat down with The Clare Champion. Irwin was a hugely interesting contributor to the event that followed, again belying his quiet image. “I don’t do too many of them but Pete has been pestering me for the best part of six or seven months. It’s always nice to come home and the Clare branch are great. They’ve got the second most members in Ireland, which is really great,” the seven-time Premier League winner said. Gary Pallister had yet to arrive but Irwin was not panicking. Well before the formal event started, Boyle, who is renowned for composing and then singing a range of Manchester United songs, felt that he was going to enjoy the night. “I’ve done lots of dos with different players and this is one of the most organised I’ve seen. They’ve not just put posters on the door. I’m well impressed with the whole set-up. For me, as a fan, it’s a dream job to be here interviewing the lads about United,” Boyle said. Surely describing his role as work is pushing it? Remember, this is a man who attended his first Manchester United game in November 1974. “I’m in Malta in two weeks singing United songs but even better than that, on November 17, I fly to Jakarta in Indonesia. The organisers have 10,000 people coming to watch me sing. I’m still going to sing at matches but I’d rather be doing more dos like this with Denis. I’ve done a few in Ireland, Norway and some in Manchester. I like the compèring and chatting. It’s not really work is it but I tell my wife it is. Hopefully, my wife won’t read The Clare Champion,” Boyle chortled. Given that Irwin represented Manchester United for 12 years, playing 529 games and scoring 33 goals, it is somewhat surprising that he never opted to coach or manage. “When I went to Wolves, I did a couple of licences up to my UEFA B Licence. Then, because I played football for 22 and a half years, I think I needed a break from it. I was doing some work with RTÉ at the time and I felt I needed a little bit of a break. But I was never going to be a manager. Coaching wise, if I kept going, I’d probably have ended up in an academy but I started doing a bit of media and now I work for the club. I travel quite a bit of the world, so that keeps me occupied. I’ll never go back into it,” the Cork man said of management or coaching. 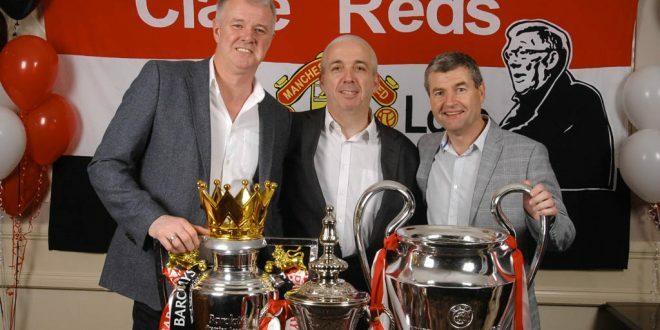 Former Man Utd stars Gary Pallister and Denis Irwin with Sean Hennessey (10). Photograph by Arthur Ellis. He pointed to his former defensive colleague Steve Bruce, now managing Aston Villa, as an example of how the stress of management can impact on a person’s appearance. Irwin noted, while Boyle feels that former players sometimes opt for a less stressful post-playing lifestyle. Irwin joined United from Oldham in 1990 and has never regretted making the move from Boundary Park to Old Trafford. 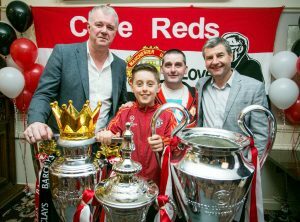 Gary Pallister and Denis Irwin with with Jack (10) and Mikey Dunleavy, Ennis. Photograph by Arthur Ellis. Since Alex Ferguson retired, United have hired and sacked David Moyes and Louis Van Gaal. Jose Mourinho is the latest tasked with the responsibility of replicating Ferguson’s glory years. “I’m hoping this year that we’ve got the right manager. It’s a very competitive league. Everybody is dropping points and I think there are possibly six that can win it this year,” Irwin said, speaking 24 hours before United lost 4-0 to Chelsea at Stamford Bridge. “There was talk that certain people at the club didn’t want him but I think that for once, it’s the right time for Mourinho to come in. Some people would argue that he was the only who had the ego to take over from Fergie but whoever took over from Fergie was going to struggle,” Boyle ventured. “I’d argue with you there. I thought he should have taken over three years ago,” Irwin interjected. Boyle, though, found it impossible to contain his excitement, claiming he hasn’t felt like this in 33 years. “I’ve not been so excited pre-season since 1983, when we signed Jesper Olsen, Gordon Strachan and Alan Brazil, who was actually a good player for a little bit. As good as Fergie was, it wasn’t always out and out brilliant football every week. If we have to park the bus in some bigger games, so be it. He’s not going to do that every game because he knows that United’s philosophy is about playing good football but you cannot play entertaining football 40 games a season. It would be great if you could,” he said, before himself and United legend Irwin headed off to prepare for the long night ahead.